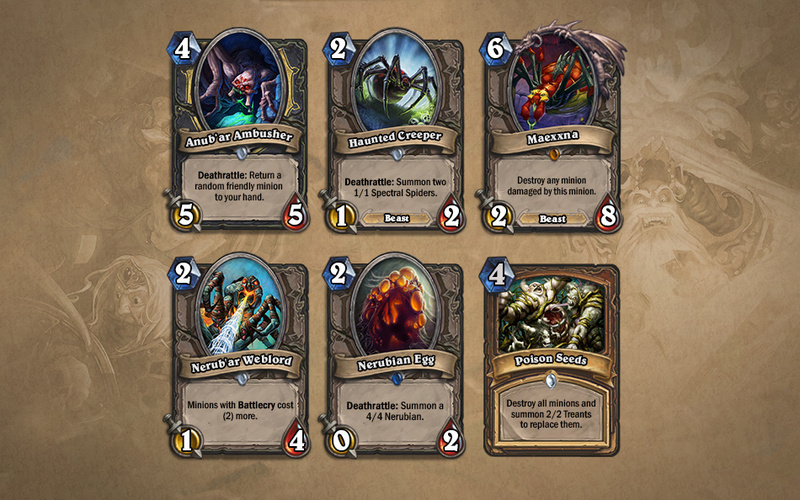 Curse of Naxxramas: The Arachnid Quarter - Now Open! Gather your strongest spells, sharpen those armaments, and dust off your spider-stompin’ boots—Curse of Naxxramas: The Arachnid Quarter has opened its gates to players! Mind the webs—they already know you’re here. . . . The Arachnid Quarter hosts undead humanoid arachnids and their masters, who are eager to eat . . . er, meet you. 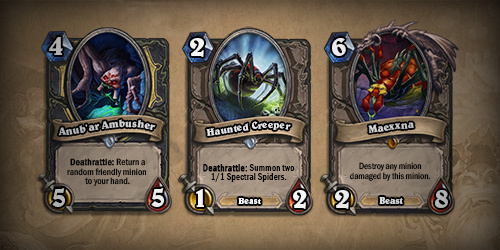 Victory over these creepy crawly cretins will reward you with all-new Hearthstone cards! The undead nerubian Anub’Rekhan is the first boss players will encounter within Naxxramas. Defeating Anub’Rekhan will award you with two copies of the Haunted Creeper card for your collection. Next, players will challenge Naxxramas’s mistress of venom and premier acolyte trainer, Grand Widow Faerlina. A victory against Grand Widow Faerlina will award you with a pair of Nerub’ar Weblord cards for your collection. 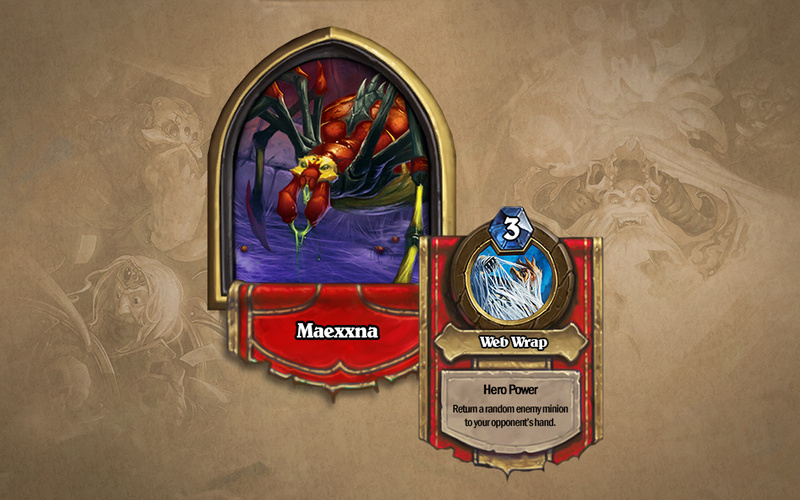 The final boss of Naxxramas is the massive spider, Maexxna. Don’t get wrapped up in all the excitement and miss out on your chance to add two Nerubian Egg cards to your collection for defeating her in a duel. 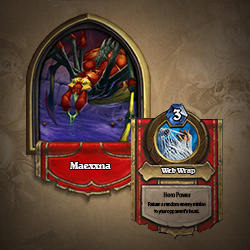 Defeating all of the bosses within the Arachnid Quarter will reward you with the Legendary Maexxna card for your collection. Your opponents may need to grab a bigger boot*! Lurking within this wing are two Class Challenges that will become available to players who have defeated all of the bosses in the Arachnid Quarter on Normal Mode. These Class Challenges will put your skills with those specific classes to the test! If you overcome these Challenges, you’ll be rewarded with new class-specific cards to add to your collection. For those of you looking for a serious challenge, Heroic Mode of the Arachnid Quarter becomes available after you’ve defeated all of the Arachnid Quarter’s bosses on Normal Mode. Heroic Mode bosses are significantly more difficult than their normal versions, and aren’t for the faint of heart (or the arachnophobic). Experience all of the creepy crawly fun of Curse of Naxxramas: A Hearthstone Adventure by skittering in to the Arachnid Quarter for free today! *Conveniently available within the garden on the Pandaria board.